The World Chess Championship is an embarrassing anachronism. It’s time to end it forever. Magnus Carlsen is the world’s best chess player, but he shouldn’t be the world champion. India’s Viswanathan Anand (R) plays against Norway’s Magnus Carlsen during the Norway Chess 2013 Blitz on May 9, 2013. While Anand is a great player, he’s definitely the underdog. Starting this week, challenger Magnus Carlsen will face champion Viswanathan Anand in a best-of-12 match in the latter’s hometown of Chennai, India, with the winner to wear the crown of World Chess Champion. The event has the feel of a coronation; even at the age of 22, the Norwegian Carlsen is already spoken of in the same breath as Paul Morphy, Jose Raoul Capablanca, Bobby Fischer, and Garry Kasparov, generally considered the very best of those who’ve played the royal game. To illustrate his dominance with one statistic: The gap in points between Carlsen and Armenia’s Levon Aronian, the No. 2 player in the world, in the current World Chess Federation ratings is greater than the gap between Aronian and the world’s No. 19 player. 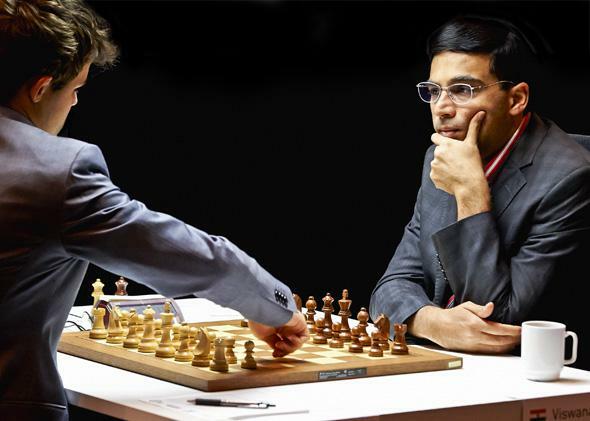 Only a very few have dominated the game like this, so while Anand is a great player and a fine human being, he’s definitely the underdog in Chennai. Even though Carlsen is the world’s best active chess player, he should not be trying to unseat Anand in a winner-take-all event. Chess has had a world champion since 1886, but this one-off, mano-a-mano event is now an anachronism, one that’s more harmful than helpful to the game. It’s time for the World Chess Federation (FIDE) to shelve it. With Carlsen looking likely to become chess’s new king, now is the perfect time to make a switch—and I know just the system to fix the game’s current championship woes. Before we get to solving chess’s problems, it’s necessary to walk through how it got stuck in such an untenable position. The first person with the nerve and talent to credibly label himself World Chess Champion was a fellow from Prague named Wilhelm Steinitz. Before Steinitz, chess had been mostly a romantic game where the swashbuckling ideal was to sacrifice a boxful of pieces to chase the opponent’s king around the board, finally checkmating him so beautifully that centuries hence, students would marvel at your derring-do. Lovely as it was, Steinitz—who ruled the game starting in the 1870s—turned that notion on its head, accepting his hell-bent opponents’ proffered pieces and living to tell the tale through calm, rational defense. He wasn’t anyone’s favorite player, but he got things done. For the next 60 years, the World Championship title was like a boxing belt: You had to beat the current holder to get it. This wasn’t a great system, since a champ could hold out for pretty ridiculous conditions, like a guaranteed rematch if he lost and retaining the title in case of a drawn match. Champs could also choose their opponents to a large extent, ducking dangerous contenders when at all possible. Consider Alexander Alekhine, world champion for almost 20 years from the 1920s to 1940s, who preferred beating up on his old punching bag Efim Bogolyubov to facing more credible opponents. An unchewed piece of steak did what Bogolyubov could not. When Alekhine choked to death in 1946, FIDE sensed its moment and stepped in to standardize the World Championship process. They first held a tournament among the world’s top eight players, which was won by a Soviet electrical engineer named Mikhail Botvinnik, who was proclaimed world champion. Future world title matches would be held every three years, the challengers decided by a series of zonal tournaments, followed by a knockout round of head-to-head matches from those tournaments’ winners. The new system was certainly an improvement on the haphazard decades that preceded it, but it had its own flaws. The three-year cycle was criticized as being too long, most vociferously by Bobby Fischer, who had been the best player in the world for seven years before getting his title shot in 1972. Match specialists—players who draw a large percentage of their games, rarely beating anybody but even more rarely losing—were favored over tournament specialists who racked up large numbers of both wins and losses. For example, retrograde rating analysis (FIDE didn’t launch its rating system until 1970) shows that although Tigran Petrosian was world champion from 1963 to 1969, he was the highest-rated player in the world for less than a year of that span, and at times was ranked as low as 10th. That’s because Petrosian was a middling (for a world champion) tournament player but a brick wall in matches: Drawing him was easy, but beating him was extremely tough. In 1993, the chess world flew into chaos: World champion Garry Kasparov and his challenger, England’s Nigel Short, told FIDE to go fly a kite. They found funding and played for the title under the auspices of their own, newly formed organization. Embarrassingly, FIDE was then forced to stage its own world championship match between two other players, both of whom Short had just trounced en route to facing Kasparov. Until the reunification match in 2006, the official and unofficial world champions coexisted uncomfortably. New systems and parameters (one-year cycle, two-year cycle, a Wimbledon-style knockout tournament, etc.) came and went. Kasparov’s organization foundered and the FIDE champions grew embarrassing. An Uzbek grandmaster named Rustam Kasimdzhanov, who’d never been in (and never would be in) the world’s top 10, became FIDE World Champion during this time. Fast-forward to this month’s world title match. Magnus Carlsen is currently the top-rated player in the world. World champion Anand is way down at No. 8. And this isn’t that unusual: Last year, Anand, while rated No.4, defended his title against the player who was rated No. 20. Some World Championship match! A player gains or loses rating points each game depending on the rating of his opponent, and whether he’s won, drawn, or lost. The more rating points you get, the tougher they are to gain and to keep. That’s what makes the 69-point gap between Carlsen and the world No. 2 so impressive. The gap between Carlsen and Anand is an even more yawning 95 points. Go back 95 points from Anand’s rating and you’re all the way back to the 64th-ranked player in the world. The problem with the title of world champion is that it’s too crude a measurement of chess skill in an era of instantly updated ratings, and you get embarrassing, confusing situations where the player who is clearly the best isn’t labeled as such. Having a world champion makes sense in boxing, where infrequent matches make comparing fighters a tricky proposition. But in chess, as in tennis, the world’s two best players will meet head-to-head as many as four or five times in a year. Tennis doesn’t have a world champion, and rightly so. That sport measures greatness by elevating four tournaments (the grand slams) above all others and assessing a player’s results there. Peaks and valleys are measured by a ratings algorithm that’s updated from week to week. Chess has the ratings algorithm, and it has the big tournaments. Now it just needs to kill the world championships. And to do that, it needs someone with the standing to do the job. Enter Magnus Carlsen. Here’s what Carlsen should do: Beat Anand for the title, and then work with FIDE to institutionalize four big tournaments as chess’s Grand Slams, simultaneously eliminating the title of world champion. Corporate funding for even major chess tournaments can come and go with frustrating regularity, meaning FIDE itself has to get involved. Perhaps the grand slam tournaments could be located in three cities permanently—Moscow, Amsterdam, and a Spanish locale such as Linares would be natural picks—with a fourth that would rotate from year to year. This would give chess the same clear and predictable yardstick for greatness that golf and tennis have instead of the extremely crude world champion benchmark. One can reasonably speculate, then, that Carlsen wouldn’t care for the world championship title even if he’s the one holding it. Here’s my advice, Magnus: Cement your legacy by becoming world champion, and in turn becoming the world champion who realized chess didn’t need that title anymore. Tell FIDE you’re willing to ditch the world championship for a slams system, which you can then devote the next 25 years to dominating. You’re only 22, so you’ve got plenty of time to become the Jack Nicklaus (18 majors) or Roger Federer (17 slams) of chess. You’re far too talented to settle for merely being its world champion.